Afghanistan, or officially the Islamic Republic of Afghanistan (Pashto/Dari: افغانستان), is a landlocked country in Southern Asia. Its capital is Kabul. Afghanistan, during History, has had strong economic bounds with other countries of Asia and Europe. It was also invaded many times (Alexander the Great, Muslims, Mongols,...). The country recently knew the emerging of Islamist fundamentalists (Talibans), and the military occupation of the country by the United States. The name Afghānistān is a Persian word, with the root Afghan meaning Pashtun (Afghan ethnic group) and the suffix -stan meaning "place of". Afghanistan consequently means "land of the Pashtuns". Afghanistan has 33 million inhabitants (42nd most populated country), and a density of 52 people per square kilometre. Its neighbouring countries are Pakistan, China, Tajikistan, Uzbekistan, Turkmenistan and Iran. The country's capital is Kabul, located in the eastern part of the country, which has a population of 3 million people, or about 10 % of the population. The other main cities are Kandahar, located south, Herat, in the west, and Mazar-i-Sharif, situated north of the country. The country generally has a very mountainous landscape. The centre and eastern parts of the country (Bamiyan, Nuristan, Badakhshan,...) are very mountainous and cold (cold semi-arid or cold desert climates), whereas the western region is very flat, desertic, and has a warm climate. Afghanistan is crossed by a mountain range, the Hindu Kush, which also crosses Pakistan. Afghanistan's highest point, the Hindu Kush's 2nd highest mountain and the world's 52nd highest mountain is Noshaq, which culminates at 7,492 metres. The Hindu Kush can cause earthquakes (approximately one per year), which can be very destructive, like the 2002 earthquakes in Hindu Kush, which killed more than 1,000 people, or the February 1998 earthquake, which killed from 2,000 to 5,000 people. These regions can also be very dangerous because of avalanches and landslides. Snowstorms also exist, and some have been quite dangerous. The general climate is very arid: the land is usually dry, and rain is very scarce (mainly occurs in the northern regions). Rainfall only occurs during certain months: September in the western regions, November in the north and south, and the beginning of the year (March, April...) in the west, including Kabul. Snow is also frequent during winter, but it often melts very quickly, as of the more warmer climates (such as the capital). It is mostly found in the cold regions of the country (cold semi-arid and cold desert climates), as well as in the mountains (Hindu Kush mountain range). Although Afghanistan has various rivers and lakes mainly in the mountains (Hindu Kush...), in large regions of the country the climate is dry and water is scarce. These rivers in Afghanistan are extremely important for agriculture, as they are used for irrigating the land. They are also the main water supply of the country. In some rivers, dams or reservoirs (like the Kajaki dam or the Dahla dam) have been created for hydroelectric power, irrigation or water supply. The country lacks reliable supplies of water: as an example, its renewable water resource is a lot smaller than the one of Pakistan, although they have approximately similar areas. As of 2012, only 27% of the population has access to improved water sources, and this can go down to 20% in certain rural parts of the country. In 1998, 85% of the water came from lakes or rivers, and 15% from underground. Agriculture in Afghanistan is very important. Today, more than 40% of the country's gross domestic product is based on agriculture, even if only 12% of its land is arable and 6% is cultivated. Although cold winters and strong rains have restraint the production, the country's productivity has improved in the last decades, and is nearing self-sufficiency in food production. Recent droughts and instability in the regions also slow down agriculture. Agriculture in Afghanistan is mainly based on the production of fruits and vegetables. Afghanistan is well known for its pomegranates are the main farmed crops in the country, and are important contributors to the development of Afghanistan. The fruit and nut exportations in 2014 was equivalent to $500 million. Animal husbandry also contributes to the country's development. 30,000 km² of land are suitable for grazing, which allow farmers to raise animals on a larger scale. However, some regions are being overgrazed. Sheep, cattle, oxen and goats are the main raised animals in Afghanistan. Although fishing is a relatively smaller economy in the country, it is an easily accessible industry, the country being crossed by many rivers and having many lakes and reservoirs. Fishing is mainly in the southern regions of the country, especially on the Helmand and Kabul rivers. Fish farms are created in reservoirs, with the help of international or external associations (like USAID). Almond trees in southern Afghanistan. Afghanistan has very few forests, due to large scale forest destruction in the last decades and illegal deforestation, especially during the war. A lot of the country's timber has been exported to the nearby country, Pakistan, generally for fuel. The forests are unequally distributed, as they are mainly located in the east, generally in the Kunar, Nangarhar and Paktia provinces. They are mainly made of oak trees, walnut trees and other types of nut species. Consequently, the government has tried to stop deforestation by replanting thousands of saplings and imposing restrictions on logging, although the problem is not yet coming to an end. Human habitation in Afghanistan started in the Middle Paleolithic Era. The country being along the Silk Road, it was easily connected to other Asian, Middle-East or European cultures. The country endured a number of military invasions, from Alexander the Great, Mauryas, Muslim Arabs, Mongols, British, Soviet or Western countries such as the United States. These invasions brought in many different cultures, religions or languages, including Greek culture, Buddhism, Hinduism, Muslim culture and Islam, Persian culture or English language. The country has also been very important as it has served as an economic, political and commercial centre, for China, India, Iran, Mesopotamia or Europe. According to archaeologists, humans settled in Afghanistan since 50,000 years. They started off as hunter-gatherers, but then developped farming. These regions are among the earliest known to have developed agriculture and farming communities. Villages and cities also appeared in Afghanistan in the Megalithic or Neolithic periods. Bactria-Margina seal, showing a bird-headed man (garuda) with snakes. Northern Afghanistan, around 2000-1500 BC. In the north of the country, ruins of ancient cities belonging to the Indus Valley Civilisation have been found, dating back from around 5000 to 2000 BC (bronze age). These cities probably had strong trading relations with Mesopotamia: trading was crucial for economic growth in the Indus Valley. Lapis lazuli, as well as many other luxurious objects (metal, pots...) were sold to Mesopotamia. This constitutes one of the earliest long-distance commercial links in the world. The Bactria-Margiana Archaeological Complex (BMAC), also known as the Oxus civilisation was another important bronze age civilisation in Central Asia, dated to ca. 2300-1700 BC, which developed material culture. Its population probably originated from Indo-European migrants who settled in Central Asia and Pakistan. It is possible that Afghanistan was occupied at one time by the Median Empire in around 600 BCE. Inhabitants of Afghanistan probably had economic or political relations with Medes. At around 550 BC, the Persian Empire, or Achaemenid Empire, was founded by Cyrus the Great. The Empire quickly took a large territory, reaching all the way to Afghanistan (Indus Basin). The large empire was divided in different provinces, or satrapies. In 328 BC, Alexander the Great took full control over the Achaemenid Empire, and in 325 BC, he extended his empire all the way to Afghanistan. Facing tribal armies of Afghanistan, the Macedonian king had to face very difficult battles in order to conquer the region. After invading Afghanistan, he headed south for India. On his way, Alexander the Great built and founded a number of cities in Afghanistan to his name. After his death, the huge Empire was fought for by a number of generals and friends of Alexander the Great (called Diadochi in Greek). It was finally divided in three parts, the largest one being the Seleucid Empire, covering the territory from the former Persian Empire, and ruled by Seleucus I. After Alexander the Great's death, South Afghanistan was given by Seleucus I to Chandragupta Maurya, emperor of the Mauryan Empire, through a peace treaty, upon marriage and in exchange for 500 elephants. The Empire was then ruled by Ashoka the Great, who extended the Empire in the east and in the north. During the Mauryan Empire, Buddhism and Hinduism were introduced to Central Asia, and many religious temples and sanctuaries were created. Afghanistan was also a pilgrimage route. Gold coin for Diodotus I. The Greek words ΒΑΣΙΛΕΩΣ ΔΙΟΔΟΤΟΥ, meaning "King Diodotus", are written on its back. In 250 BC, Diodotus I, satrap of Bactria, founded the Greco-Bactrian Kingdom in the north of Afghanistan. His territory grew and ended up encompassing northern Persia, Afghanistan, Turkmenistan, Tajikistan and Kyrgyzstan in around 200 BC. The Empire was shared between a Greek culture, which came from Alexander the Great, and a Persian culture. After his death succeeded a number of different kings, until the end of the kingdom in 130 BC. The Indo-Greek kingdom was a Hellenistic kingdom which emerged in around 180 BC in north-west India, and which extended north towards the Greco-Bactrian kingdom. In the 1st century BC, the Scythians, or Saka, an Iranian and Eurasian nomadic tribe, migrated to Central and South Asia. 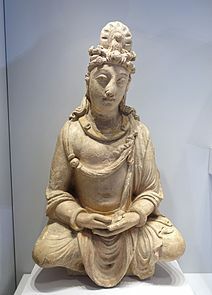 Buddhist statue found in the Nangarhar province, north-east Afghanistan. 2nd-4th century AD. The Parthian Empire, also known as the Arsadic Empire, was the second Persian Empire, founded in around 247 BC, in Northern Iran, by Arsaces I of Parthia. The Empire then reached to Afghanistan in 100 years, after a long series of conflicts with the Seleucid Empire. In the 1st century BC, the Indo-Parthian Empire, located in modern-day Afghanistan and Pakistan, made an alliance with the Parthians. In around 130 to 100 BC, the Tocharians, who inhabited oasis settlements on the Tarim basin (north-west China), developed city-states, which served as stopover or depot for the Silk trade. They lived in a territory encompassing the north of modern-day Afghanistan. In the early 1st century AD, the Kushan Empire was formed in Bactria. The Empire took over the Tocharians and grew to encompass most of present-day Afghanistan. The Kushans came from the Yuezhi tribes, who lived in eastern China, and who migrated to southern Asia in the 2nd and 1st centuries BC. The Kushans were fervent buddhists, as many buddhas and other buddhist figurines or monuments have been found dating from the Kushan period. The Empire was founded by Kujula Kadphises in the north of Afghanistan, but was then expanded under the reigns of Vima Taktu and Vima Kadphises, until it reached its peak, under Kanishka the Great. The Sassanid Empire, or Sasanian Empire, was founded by Ardashir I, or Ardashir the Unifier, after the collapse of the Parthian Empire, in 224 AD, and replaced the Persians. The Empire was then expanded in the West, and by 260 AD most of Central Asia had been invaded. The Sassanids took over the Kushans in 250 AD. The Empire lasted a very long time, and knew a Golden Age, from 300 AD to 620 AD. While Zoroastrianism was the main religion under the Empire, Christians and Jews were persecuted. The Empire had a strong army, which made it stable and protected it from other invaders. This page was last edited on 26 June 2017, at 23:06.